To celebrate the approaching year-end, I compiled a list of ten useful things I’ve learned and added to my toolkit in 2010. 1. How easy it is to make useful videos with a webcam, Screenr, iMovie and a quiet room. 2. Closed networks & organizational silos = closed minds. 3. There’s a technical term for that midmorning coffee break or lunch outing with colleagues: “Developing my Social Learning Network”. 4. Break your courses into several short chunks of content. Small learning units are less intimidating to start, easier to apply and more engaging for learners. 5. Use textures to make slides more interesting. 6. It’s possible to succeed as a freelance designer or other small business owner with this marketing plan, if you know how to be human, sound human and act human: Facebook, Twitter, Blogger & Flickr. 7. The #1 elearning subject area for 2011 will be performance management, coaching, leadership development, etc. Whatever you call it, companies want their leaders to supervise staff members positively and productively. 8. 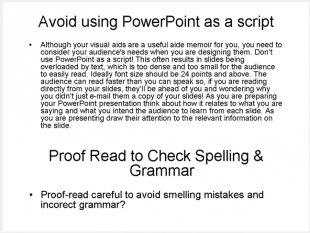 If a presenter uses their Powerpoint deck as a teleprompter or utters the words “I’ll just give you a minute to finish reading this slide”, it’s time to leave. 9. Evernote is an amazing tool for organizing notes, photos, websites, and everything else you think about, across devices. Thanks to the The Learning Circuits Blog for inspiring me to think reflectively about my own learning.